Former Magnetics lead guitarist/vocalist Jim Barbaro is one of the last true romantics. After recording two albums with the popular North Atlantic group Magnetics, Barbaro goes it alone with three solo albums under his belt, finding his groove and niche as a world rock artist. As he writes songs for a new project, you can follow his solo path with Eco Logic, Burning Blue, and Sketches and the compilation CD Smashville. In an era of cold, calculated, and less classically structured songs, Jim has found his calling in a multi-genre approach that follows the mantra of romance, passion, and melody (RPM). At the crossroads of his career, the rugged jazz influenced rock artist with a Mediterranean soul had a propitious encounter with publisher Bernadette O'Reilly, who suggested a meeting with songwriter/producer George A. Gesner. It was a match made in Saugerties, New York, where Jim hails from. Barbaro paints a timeless canvas of acoustic flavored music that fuses rock, classical, western, jazz, and folk, and is not afraid to cover the whole dynamic range. When you get your hands on a Jim Barbaro CD, you get a healthy palette of Spanish guitars, violin, cello, dobros, trumpet, Hawaiian guitar, pedal steel, as well as traditional rock and folk instruments. It all gets topped off and woven together by Jim's dynamic, full-throated vocals that range from deep and soulful to rough 'n' gritty to satiny smooth. Although Barbaro is known for his masterful voice, guitar enthusiasts will be pleasantly surprised to see how accomplished he is on guitar and the many styles at which he excels. Since the age of 13, Jim has been singing, playing guitar, and writing songs. He studied classical guitar with the late Stanley Watson and jazz guitar with John Scofield and Paul Weiss. With his original jazz fusion band, Xyphus, he appeared on stage with Fleetwood Mac, Joe Farrell, Michael Urbaniak, The Fabulous Rhinestones, Jam Factory and others. 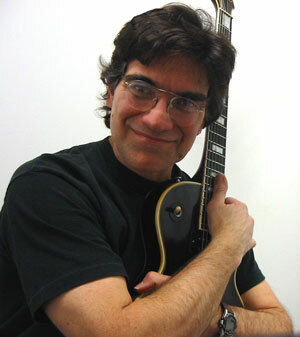 Jim achieved further notoriety with The Magnetics, a rock/pop quartet who released two albums and extensively toured the east coast playing colleges and other venues, receiving rave reviews from the legendary Bitter End in New York City to Sloppy Joe's in Key West where Jim first met the appreciative Steve Winwood during a performance. In a marketing driven music industry where artists are discouraged from jumping from genre to genre, Barbaro is not afraid to take that leap and explore the many worlds music has to offer. And to all of you adventurous and multi-dimensional music lovers, feel free to come along for the ride.